Next Tuesday, September 24, SDOT and King County Metro will host an open house from 3:00 – 6:00pm to discuss the new streetscape vision to organize, humanize, and energize Third Avenue in downtown Seattle. The open house will take place at Benaroya Hall, Boeing Company Gallery, and everyone who attends will have the opportunity to comment on a 10% streetscape design. Mayor Mike McGinn announced on September 16 that the City’s Neighborhood Street Fund Large Project Program will invest in 12 community-requested projects. Projects were evaluated on a variety of criteria, such as investment impact, quality of life enhancement, safety, geographic distribution, and cost. The project list can be found here. Seattle’s first parklet opened this week at 1506 E. Olive Way. Seattle voted to adopt an Urban Forest Stewardship Plan, which will preserve and enhance Seattle’s trees and forests. The Plan includes over 100 specific actions to be taken to meet its goal of preserving, maintaining, restoring, and planting trees, as well as increasing canopy tree coverage to 30% by 2037. View the new Streets and Sidewalk Brochure, which talks about the importance of sidewalks in a community and how citizens can help keep them in good condition. One writer talks about how a healthy downtown is vital for a healthy community. He cites a study in Canada, which found that although downtowns often take up up as little as one percent of citywide land area, they nonetheless attract ten or twenty times that in terms of contributions to the city’s economic value. 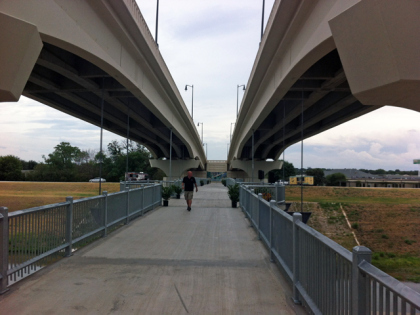 A new pedestrian-friendly bridge opened in Fort Worth, Texas. The bridge features a unique design, as the pedestrian trail has a bridge all its own suspended underneath. The new design offers pedestrians and bicyclists a convenient way to cross the river without the dangers of being near a busy street. On Saturday, 400 students at Missouri State will help assess the walkability of neighborhoods in Springfield. They will walk to schools and churches, talk to neighbors, and get a feel for how easy and safe it is to get around. Adelaide, Australia created the world’s first solar-powered public transportation system. What happens when women are asked for suggestions in transit and pedestrian-related improvements? A case study in Vienna, Austria talks about designing a city for women.